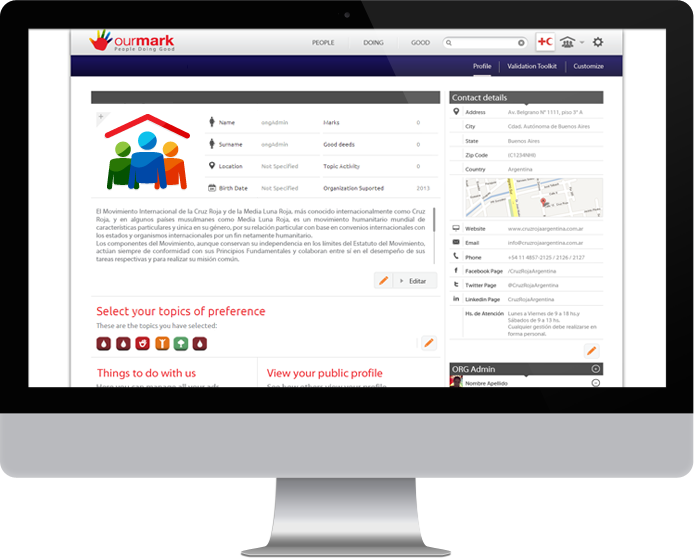 OurMark is a system for organizations to recognize and highlight the various contributions of their supporters, engaging with them in an innovative way to build an effective, long lasting relationship. 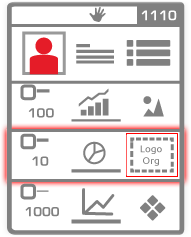 Encourage your supporters by recognizing their good deeds in a personalized way, and showcase your brand with the customizable tools for organizations. 1. Proactively recognize its supporters. 2. 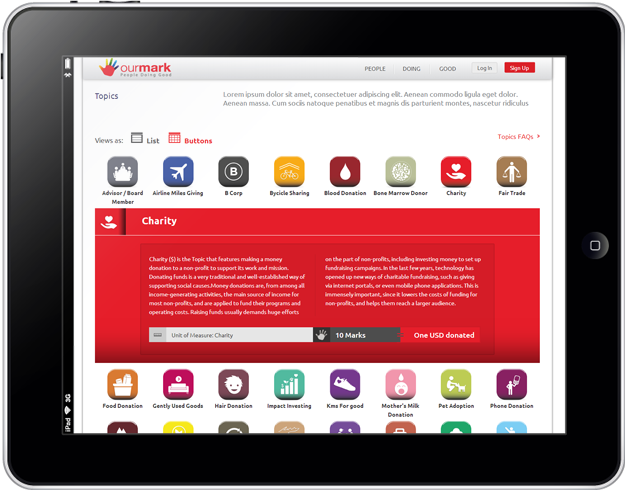 Endorse the good deeds that its supporters added in OurMark. 1. Proactively recognize its supporters..
A person contributes to or through your organization in one of your Topics of activity. A certificate is sent to the person through one of the recognition modes. The certificate carries with it your organization's brand and relevant information you want to share with the world. 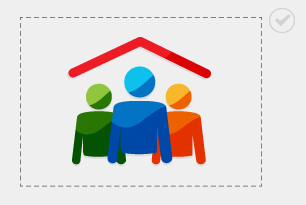 The contribution of your supporter is registered in his or her Mark, which will also feature your organization. A person uploads a good deed, indicating it was made in favor of or through your organization. 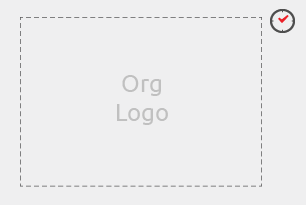 Your organization is featured in a "pending endorsement" mode, until you decide to endorse the good deed. OurMark notifies your organization of this by Email, so you can endorse this good deed. You can also edit or reject a good deed via this function. Your organization can send a customized certificate to endorse the contribution made. 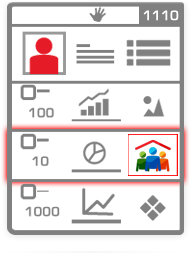 The contribution of your supporter now features your organization's logo, which will be there every time he/ she views or shares this profile. Once you have endorsed your supporter, your logo is fully featured in the person's Mark, which is now a means to promote your work. Post the opportunities for people to make their Mark by contributing with or through your organization. Attract the support you need by reaching groups and individuals who are interested in the Topics that you work in. The Topicpedia section helps individuals learn about new ways of Doing Good - our Impact Topics - and then connect with the organizations that are actively taking part. Your organization can promote its activities and opportunities in our "Find things to do" section and attract the support and resources you need. Reach out to an extended audience of highly motivated people, active in all the other Topics and wanting to find new ways of increasing their Mark. Encourage your supporters to become promoters of your work: by sharing their certificates and Marks, they remind, inform, and inspire others to take action. Connect with a Doing Good community. Hey people! Check out what Jess just shared. The impact of just one blood donation is amazing. How come we don't all donate more regularly? Guys, our friend Jess donated blood this weekend. Who wants to come over tomorrow? Can't this week, but we are setting up a blood drive at the office for next week. I'm in! It's been years since I last donated, and I just realized!! Check out Alan, he's been awfully busy during his holidays! Congrats Alan, your team at the office is proud of you. Alan, I was not aware of tree planting activities in the area. Can you send me some info? I need to do some catching up in these things. I am usually too "busy" and short of time. But if Alan can find the time to help others, so can the rest of us. I thought I was doing pretty good, but @alanpittt set a new standard. Here I come! Hey @Alanpittt, #volunteering is great! 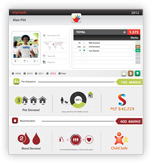 check out #blooddonationLA, you'll love it! @Alanpittt is Alan-Doing-Good, what an example. Cheers! When did you find the time to do all of this?!?!?! Love it! Great display! Didn't know one could put all those things together. I have done? Check out Alan, he's been awfully busy during your holidays! Congrats Alan, your team at the office is proud of you. Jess, drop me a line next time you donate, let's go together. Wow, I didn't know this Blood Bank was so close to my place. Signed up for next week already! Almost 10 million people donate blood every year in the US. That's great! But we still need more to be on the safe side. Help me spread the word! #peopledoinggood.